Will Erdoğan Rig Turkey's Election? 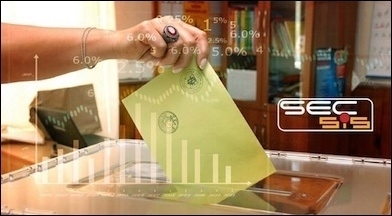 Turkish opposition parties are mobilizing tens of thousands of volunteers to verify that numbers recorded at polling stations are faithfully entered into the government's Elector Record System (SEÇSİS). Will it be enough? Abdullah Bozkurt, a columnist for Today's Zaman, has a long analysis, "Hacking democracy in Turkey," about how the AKP might steal the Turkish election on Sunday. Bozkurt starts out by positing that the only way for Turkish President Recep Tayyip Erdoğan to achieve the 276 seats needed to form a government without coalition partners is "to steal the election in plain sight on November 1 and crush the ensuing uprising with brute force," much like Iranian Supreme Leader Ali Khamene'i did in Iran in June 2009.
given the strong public awareness of the significance of vote counting among opposition parties, media and advocacy groups. Furthermore, the international observers' missions by the Parliamentary Assembly of the Council of Europe (PACE) and the Organization for Security and Cooperation in Europe (OSCE), whose blessings give a legitimacy to elections, serve as a deterrent to possible fraud activity en masse. Bozkurt then gets into the technicalities of the heist, focusing on Elector Record System (SEÇSİS) software officially run by the Supreme Election Board (YSK) but in fact controlled by the Ministry of Justice, which is in turn under a loyal Erdoğan henchman, Kenan İpek. Bozkurt mentions rumors about a hacker team from India tasked with reprogramming the software to favor the AKP in close races. Given that results must be contested within 48 hours, this operation "will require vast human resources and an army of lawyers." It's much easier for Erdoğan to sideline the parliament and formal government afterwards than to rig the vote. This will be all the more difficult because, he expects, the AKP will likely have the state-run Anadolu news agency report bogus results, making the fraud hard to trace. Only the private Cihan news agency, with its network, resources, and manpower, can pull the data and relay it to the opposition parties and media. Accordingly, he figures, Cihan will be targeted by "Erdoğan's thugs if they decide to rig the elections." Neither the military nor the police force will risk confronting such a tsunami and definitely won't side with Erdoğan against the people. The president knows this as well. And perhaps that is why he has been grooming paramilitary forces, such as the Ottoman Hearths, attached to the AKP's youth branches. Radical Islamist groups who have been trained and have fought in Syria under the political cover and logistical support of Turkey's Islamist rulers may come in handy when confronting Erdoğan's foes. This scenario is certainly possible but, as I have explained elsewhere, it's much easier for Erdoğan to sideline the parliament and the formal government, running the show from his massive palace with thousands of operatives.